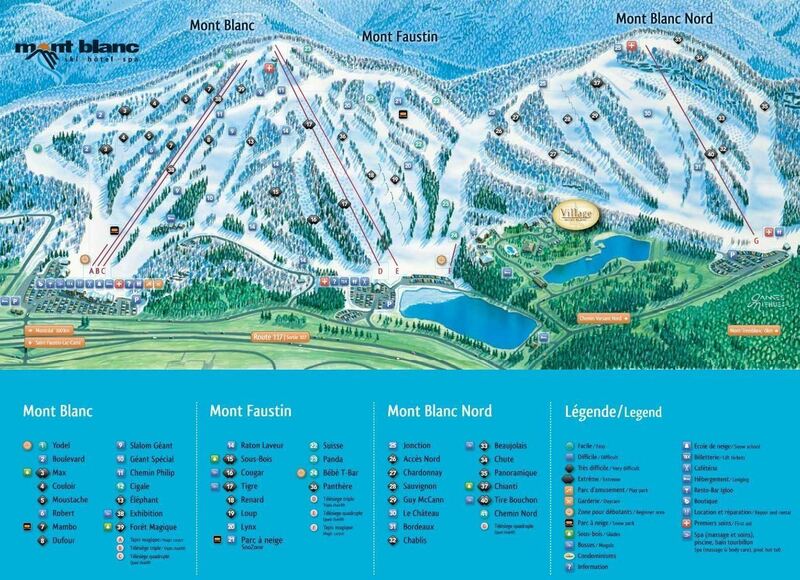 Mont Blanc is the second highest ski resort in the Laurentians. 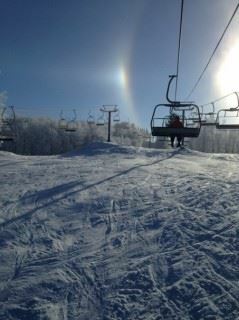 Situated about 75 minutes north of Montreal in Saint-Faustin-Lac-Carré, QC, they offer a remarkable amount of variety. Catering from beginner to expert, and from young to young-at-heart, everyone is bound to find something that appeals. 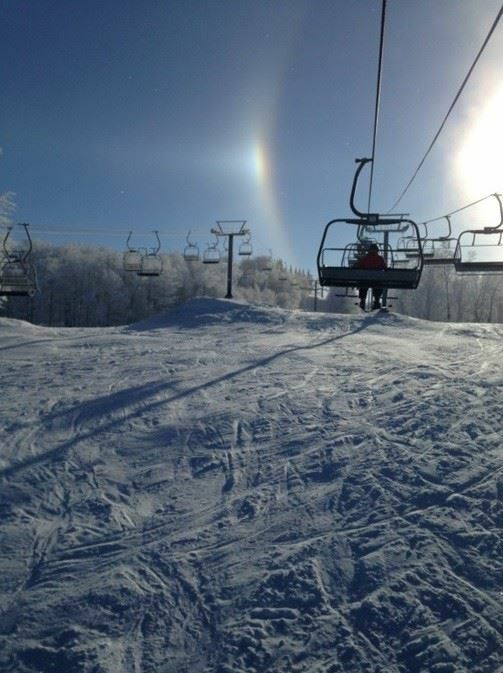 42 trails are spread across 3 mountain faces, and are served by 7 lifts, consisting of 5 chairlifts and 2 magic carpets. Situated in the Laurentian "snowbelt", Mont Blanc receives, on average, 300 cm of snow each year. To ensure optimal conditions at all times, snowmaking covers 85% of skiable terrain, and state-of-the-art grooming machines ensure consistency, regardless of the weather or temperature. The Mont Blanc side is the main side of the hill, and houses the large, multi-function chalet. Offering the widest range of variety, this side features everything from the Yodel, an easy trail that winds its way around the side of the mountain, to the Géant, a wide giant-slalom trail with a good pitch, perfect for high-speed carving. This side also offers glades of different levels such as the Max and the Foret Magique, as well as steep, narrow trails like the Couloir. The main magic carpet area, serving the ski school as well as the general public, is located here. Mont Faustin, the second and central side of the hill, is loved for its long, wide, cruising-type trails. Pitches are generally consistent, and the beginner trails, namely the Suisse and the Panda, are perfectly suited for learning the fundamentals. Trails like the Lynx and the Renard are steeper, and offer consistent pitches allowing for uninterrupted turns. On this side, skiers will find a trio of the hardest terrain on offer: the Tigre, Cougar, and Sous-Bois. Mont Faustin allow houses the "SnoZone" snow park, and there is a secondary magic carpet and learning area at the base. In the afternoon, this side has great sun exposure. Moving over to the third peak, Mont Blanc Nord is a retreat for advanced skiers. It offers only intermediate and advanced terrain, and is the perfect place for high-speed carving or mogul skiing. There is a variety of trails on this side, ranging from wide cruisers (Chateau, Guy McCann) to moguls (Beaujolais), and glades (Chianti). After a big snowstorm, the hill leaves many trails on Mont Blanc Nord ungroomed, and there are multiple trails with no snowmaking, which is great for people who prefer more natural conditions. This side also offers beautiful views of the Tremblant region, perfect for a family photo shoot. Located at the bottom of the Mont Blanc side, the main chalet features many services setting it apart from other ski hills. The beautifully-renovated cafeteria is large and has an endless list of meal options, and the indoor pool, hot tub, and spa is a great way to end the day. "Jungle Magique", a large indoor play center, is a much larger version of something you'd find at McDonalds, and offers hours of fun for kids. There is also a large bar, which often has live entertainment for après-ski on Saturdays. 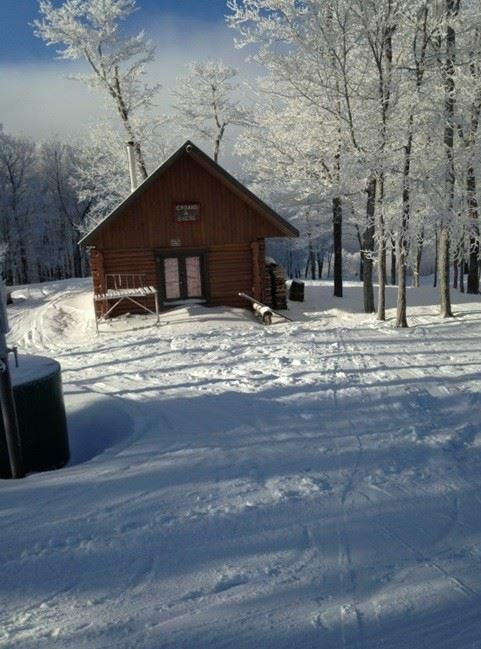 At the top of Mont Faustin lies everybody's favourite hang-out spot, the sugar shack! 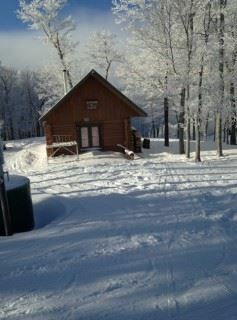 Opening in February, it's a great place to hang out, enjoy the fire and your tire-sur-neige, and soak up the atmosphere. Unique to Mont Blanc is their many different lodging options. In the main building at the bottom of the Mont Blanc side, visitors will find the Auberge. Featuring hotel-style rooms, guests have access to the pool area and Jungle Magique, and enjoy a complimentary hot breakfast in the morning. Situated on the Mont Faustin side, the Village Mont Blanc consists of modern ski-in, ski-out condos housed in many buildings. Owned by individual investors, they are available either for nightly stays, longer-term arrangements, or for purchase. These condos are considered the more luxurious option, and guests have access to all of Mont Blanc's services, plus an outdoor pool and hot tub in the summer, as well as a private beach and lake. Bigger than most places in the Laurentians, and with three distinct mountain sides, Mont Blanc has a resort feel without the crowds and the cost of Tremblant. They also offer great variety: there is something for everybody, regardless of age, interests, or ability. Lastly, Mont Blanc presents the perfect environment and facilities for families. The ski school and giant play park ensure that kids are educated and entertained, and the friendly, laid-back atmosphere appeals to families of all ages. Where Mont Blanc differs, however, is that their vast and varied terrain ensures that parents won't get bored!